Curious Nashville: Why Did O. Henry Choose The City For His Famous 1904 Short Story? This iconic view of a new Union Station, circa 1900, is what welcomed O. Henry to Nashville during his visit around 1904. His story "A Municipal Report" opens with a train station scene. There was a time when one of the most acclaimed authors in American literature set a story in Nashville. In the early 1900’s, O. Henry wrote “A Municipal Report,” a gritty mystery that plays out in a city grappling with its identity. A recent Curious Nashville listener asks if O. Henry had ever actually visited, and why a famous author would choose to set a story here. 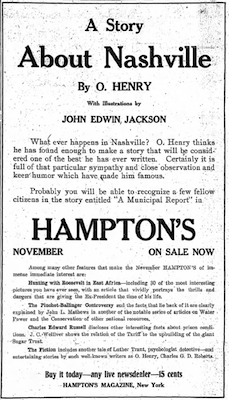 How did O. Henry come to write his short story "A Municipal Report" about Nashville? Are any of the characters based on real people? Our question asker is a Nashville native who says he first read "A Municipal Report" in school, and always wondered if there was any truth to the story, which opens with the narrator disembarking a train at what was then the gleaming new Union Station. The humorist carries on with subtle and blunt digs at the city. To O. Henry, the horses pulling his carriage are "beasts of a bygone era," and the service at his hotel "as slow as the progress of a snail." As he walks downtown streets, he says they seem to all lead uphill, and he whips up myriad ways to describe the city as boring. "The drizzle and the monotony of a dreary, eventless Southern town had made me tired and listless," he writes. This 1909 bookseller ad touts "A Municipal Report" as one of O. Henry's best stories. The short story also takes on an unusual format. O. Henry weaves in what appear to be direct quotes from the city’s actual annual municipal report, which in those days was a kind of yearbook documenting each city department. For example, the streetlights cost $32,470 to run each year; there were 137 miles of paved streets; and Nashville was ranked as the fifth largest boot and shoe market in the country. However, despite these vivid details, it was unclear whether O. Henry actually came to town. The piece would become one of O. Henry’s most popular — later surpassed by "The Gift of the Magi" — but it also drew derision from locals. A 1909 article refers to the story as "cheap magazine flotsam," and recommends that O. Henry get some "rest in a sanitarium." Others defended the culture and industry of Nashville. And throughout, residents wondered if the author had a chance to really visit. 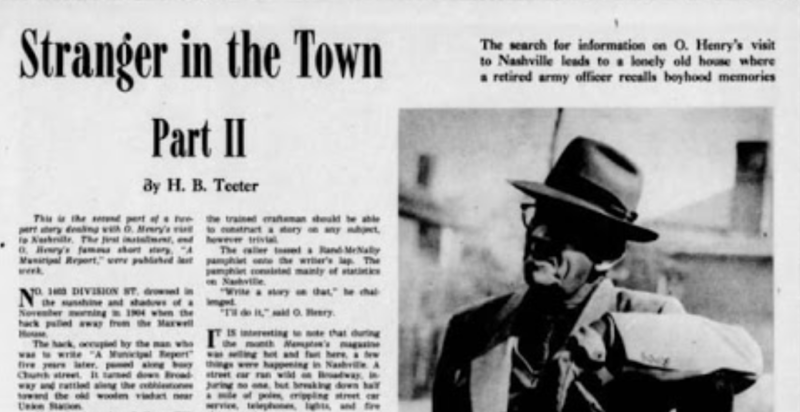 In 1951, The Tennessean dedicated a two-part story to revisiting whether O. Henry actually came to Nashville before writing "A Municipal Report." This question prompted a two-part investigation by The Tennessean in 1951. The reporter found that O. Henry had stayed at the Maxwell House Hotel under his real name, William Sidney Porter. From there he tracked down a relative, Col. J.A. Boyers, who confirmed O. Henry had indeed come to Nashville to see his daughter, who was going to Belmont College for Young Women. In an archival recording, O. Henry states that "All of my stories are experiences that I’ve actually come across during my travels. My characters are facsimiles of actual people I’ve known." And he says truth is often stranger than fiction. "A Municipal Report" follows the topsy turvy path of a strange dollar bill through Nashville. The ragged mark changes hands from the narrator to a carriage driver, to an impoverished writer and to a former Confederate. The plot gives readers a peek beneath the emerging city’s surface, and reveals a gritty, complicated reality. Because O. Henry was known for surprise endings, we won’t share much more here. But why set a story in Nashville? One reason: another prominent author of the time made a bold statement that O. Henry included at the beginning of his story. "Fancy a novel about Chicago or Buffalo, let us say, or Nashville, Tennessee! There are just three big cities in the United States that are ‘story cities’ — New York, of course, New Orleans, and, best of the lot, San Francisco," said American journalist Frank Norris. O. Henry set out to prove that wrong. 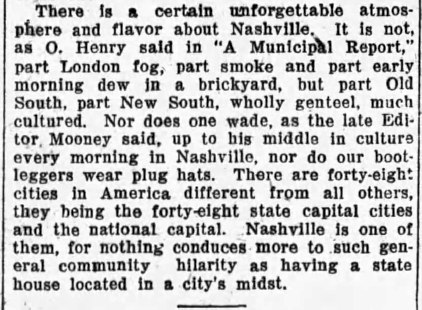 As of 1931, a columnist was still taking umbrage at O. Henry's description of Nashville. He expresses as much when a principal character in the story says, "Isn’t it in the still, quiet places that things do happen?" "A Municipal Report," proved that interesting stories exist everywhere, says Davidson County historian Carole Bucy. It became nationally popular and stood out for its time. A former slave in the story ends up playing the hero. "African-Americans, unfortunately were generally portrayed in the literature as very very much second class citizens," Bucy says. The story still does include disturbing worldviews and upsetting language. But in its twist ending, it did overturn some southern stereotypes. Bucy says O. Henry wanted to show the duality of the city. On one hand, Nashville had a dark underbelly, but officials were trying to promote a different image. They marketed Nashville as "a progressive 20th century southern city, bustling with opportunity for investments, banking enterprises, commercial interests," Bucy says. And while Nashville may no longer smell of industrial smog and honeysuckle, its business aspirations haven't changed all that much. There’s a small area of downtown Nashville — about 5 square blocks — that says a lot about how neighborhoods get their names. These days, it’s SoBro. But 130 years ago, it was Black Bottom.